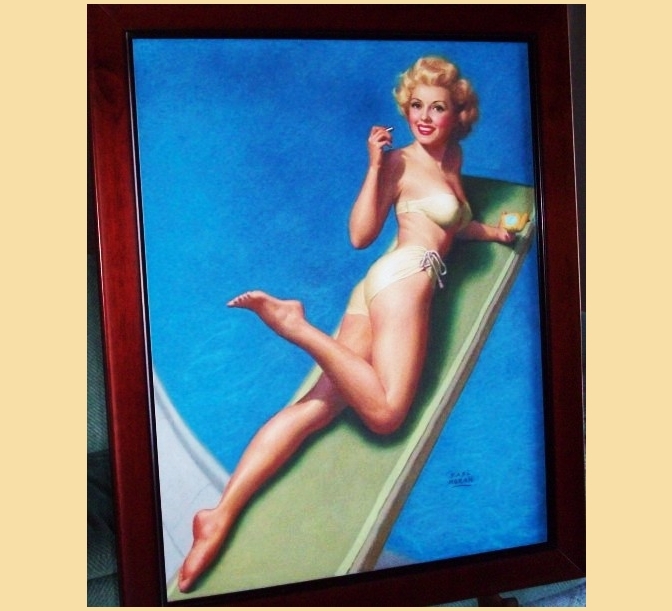 This pastel on board image of a girl in a swimsuit, applying lipstick is model Martha Stewart, who was Perry Como's singing partner on the radio in the 1950's. She also starred in several movies. This image was created in 1952 for the Brown and Bigelow Calendar Company. This painting is a flawless stunning example of the perfection that Earl Moran was able to achieve in his pin-up pastels. Earl Moran was one of the most important pin-up and glamour artists of the twentieth century. He was born on December 8, 1893 in Belle Plaine, Iowa. As a child, Moran was inspired by the work of Charles Dana Gibson and James Montgomery Flagg. Growing up on a midwest farm, he longed for the lights and glamour of the big cities. He studied at the Art Institute of Chicago for 2 years, and moved on to Manhattan, where he would enroll at the Art Students League and study under muralist Vincent Dumond, Robert Henri, Thomas Fogerty (Norman Rockwell's teacher) and the legendary anatomist George Bridgeman. As a way of introducing himself, Moran sent some paintings of girls in bathing suits to the Thomas D. Murphy Calendar Company and Brown and Bigelow Calendar Company. When both companies boought his work, his career was launched. In 1932, Moran signed an exclusive contract with Brown and Bigelow. In 1946, after surviving a scandalous divorce, and having become Brown and Bigelow's best selling pin-up artist, Moran packed his bags and moved to Hollywood. He had already painted several movie stars, including Betty Grable for publicity posters. It was in Hollywood that he soon interviewed a young starlet named Norma Jean Dougherty who was interested in modeling for him. The two became friends and she changed her name to Marilyn Monroe. Marilyn would pose for Moran's paintings for the next four years. She always credited Moran with making her legs, (which she believed were too thin) look better than they were. Moran once commented that "her body was as expressive as her face, which made all her poses good". Creating just the perfect amount of light on his models was important to Moran, and he was an expert on lighting his models and sets. He used photography to capture the candid, natural expressions that he sought in his work. Moran worked in a variety of sizes and mediums throughout his career. His originals for the pin-up and glamour market varied widely in size, but generally he was most comfortable working in pastels, which were often 30 x 40 inches. Some of his magazine work is signed "Steffa" or "Black Smith". Earl Steffa Moran died in January of 1984.